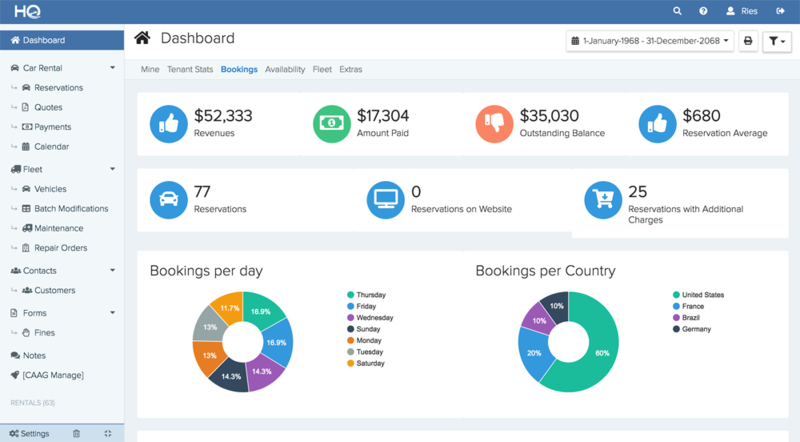 This bookings dashboard tab tells you an overview of all your company financial details for a certain period of time. This number is the total amount that the company has made from bookings during the period of time. This number is the amount that your company has received from registered payments during the selected period of time. This number is the amount of money that your company has yet to receive from your customers during that period of time. This number is the amount of money on average that your company makes during that period of time. This number is the number of reservations that your company has made during that period of time. This number is the number of reservations that were made through the website that is integrated with the system during the period of time. This number is the number of reservations in which the customer has requested for additional items that your company provides during that period of time. This number is the average number of days that a customer rents a vehicle from your company during that period of time. This pie chart tells you which day attracts the most customer during that period of time. This pie chart tells you which country is most of your customers from, during that period of time. This shows you the number of reservations made over the period of time in the form of a graph. This shows you the total amount of revenues that your company has made over the period of time in the form of a graph.